I remember seeing a primary school classmate cry when she got her first pair of much needed glasses. I didn’t understand why she was so upset - I’d worn glasses for years and knew they weren’t that big a deal. She turned to me, tears streaming down her face, and sobbed “The trees have leaves! I didn’t know!” At the time, I simply didn’t understand why it was such a life-altering experience for her to suddenly be able to distinguish individual leaves. She’d been getting along just fine seeing the playground as green blobs on sticks. But today, having experienced times when my own cherished garden morphed into a vague palette of greens and browns, I’ve learned to treasure the experience when I can look down and know precisely which plant is what. I’m more grateful than I can express that my vision is perfectly functional most of the time. But sometimes in a moment of crystal clarity I find myself grinning crazily at nothing, almost overcome with the sheer pleasure of seeing things. It’s impossible not to want to make people with normal vision understand the great blessing they may take for granted. And it’s made me think a lot about others who have “seen” things that the people around them were blind to. 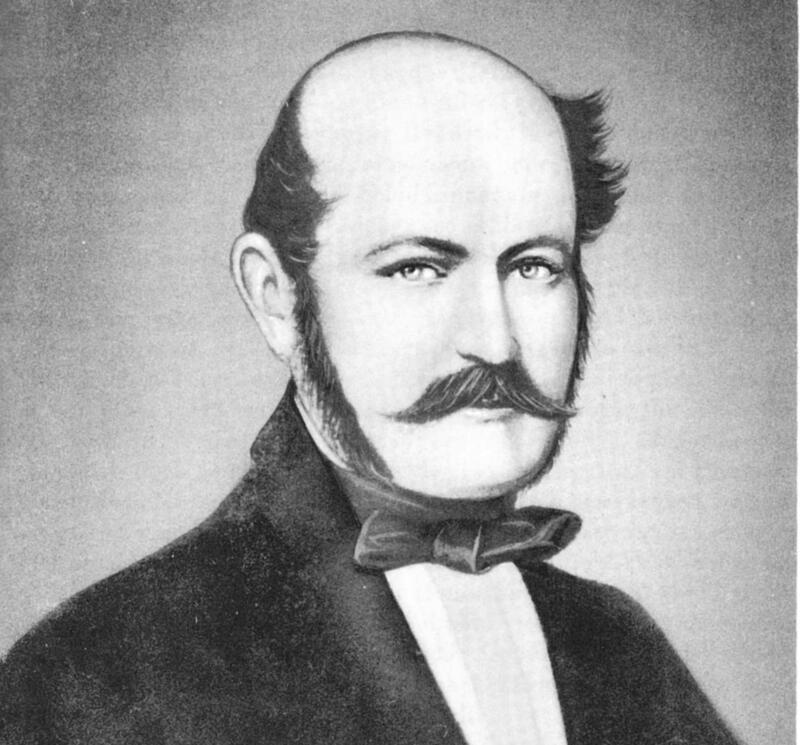 One of my great idols is Dr Ignaz Philipp Semmelweis, considered the “father of antisepsis”, whose biography I read several times as a teenager. During his lifetime he was a much misunderstood visionary who recognised the importance of disinfecting ones hands before touching the next patient – a suggestion that greatly offended his nineteenth century medical colleagues who refused to follow his advice. After witnessing woman after woman dying from infection after giving birth in the unsanitary conditions of the Viennese hospitals of his time, Dr Semmelweis became crazed with anguish and helplessness. He is described roaming the streets of the city, imploring women and their husbands to “ask the doctor to wash his hands”. In the end, unable to convey his life-saving message to those who most needed it, he died of sepsis himself soon after being committed to an asylum during a rambling breakdown. How could no one else of his time have seen that something as simple as hand washing could save so many lives? Perhaps the nearest I have come to truly empathising with Dr Semmelweis’ frustration at having no one understand his vital message has come from living with MS. When you have something fundamental go wrong – as happens with every flare – it gives you a completely new appreciation of how truly amazing “normal” was while you had it! I have found myself fantasizing about how differently I would have felt about life before I had MS if I had only realised how exquisitely precious it is to feel normal - and wondering if I should be donning a placard and walking the streets ringing a loud bell and calling out to everyone with “normal” health to sit up and enjoy what they have while it lasts. It gets easy to see how Dr Semmelweis ended up dying in an asylum! Probably each of us would have some advice for our younger selves if we could start life over from the beginning. But I question – would we have listened if someone had tried to impart the wisdom we now have when we were at a stage in life to take advantage of it? I don’t know. What I do know is that there is someone out there who would look at me now and be just as sure that they could offer me advice from their perspective as I am sure I could educate someone who has not (yet) been diagnosed with any health challenges to appreciate what they have. Perhaps we’d all be better off looking at our own lives and living today as well as we can, rather than trying to pass on lessons that may not resonate with those who have not shared our experiences so far? One of my Twitter mates has written about the evolution of his hobbies and interests over his time with MS so far, describing “embracing change” as his approach to enjoying life. It’s a really good philosophy. And it’s not always terribly difficult. I was devastated when I first realised that full-time work was no longer a viable option for me, but once I embraced the lifestyle associated with part-time employment I realised how much I had actually gained. So perhaps I’ll leave the placard and bell at home for now and simply challenge myself to consciously relish some aspect of each new change that MS brings into my life. Stay tuned and I’ll let you know how I get on! I started reading your blog and could totally relate, the same happened to me - I remember sitting in the car after getting my first pair of glasses (which I didn't want), looking at a tree across the street, amazed at the infinite number of leaves and colours, how they played in the wind. My sister asked me that night when I would take my glasses off -NEVER- why would I want to go back to not seeing clearly? I had a surprisingly similar reaction when I started using a wheelchair, after struggling for years with sticks and a frame. Moving easy again! And normal speed! I no longer felt 'trapped' in my body by MS. I can now go out for no reason except to enjoy the JOY of movement! When I spend time now walking around I have the same feeling I get when I take my glasses off: yes I can function, but just it's limited and frustrating. I know wheelchairs get a bad rap (and I totally get why), but when you spoke so eloquently about the experience of seeing well (either with an 'aid' or remission of symptoms) I wanted to share that the same can be so for wheelchairs as an 'aid', as the description you wrote is the closest I have found to describing it. Thankyou! Dear A - thank you so much for that! It's great to hear there are real positives for you in the freedom a wheelchair has provided. You sound like the perfect example of someone who has done what I have committed to attempting - seeing the positive side when MS brings a new challenge into our lives. So thank YOU for highlighting a very real benefit from something many of us look at as one of the bigger challenges MS may have in store for some of us! Thanks, too, for joining in the "uninterrupted" conversation! Your positive and delightful attitude signs through yet again in this post. Thank you!